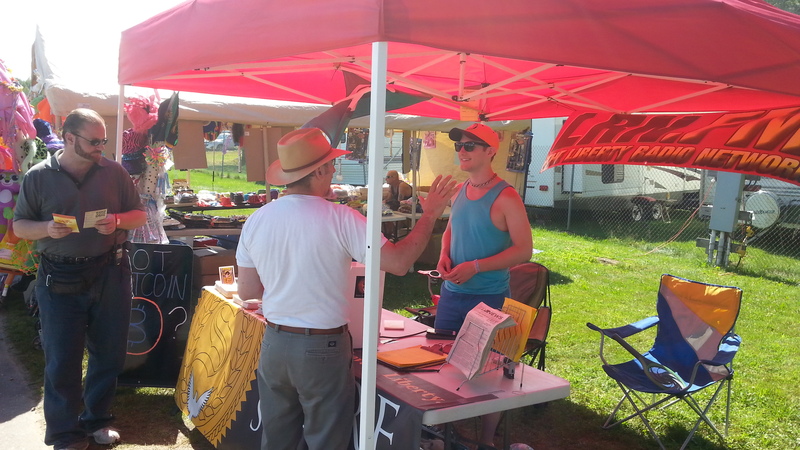 Last year, Keene liberty activists manned a bitcoin outreach booth at the Cheshire Fair. In that five days, we installed a grand total of three bitcoin wallets (though we did hand out hundreds of bitcoin flyers). This year, we did it again and installed eighteen wallets, had dozens of great conversations, and shared bitcoin intro flyers with hundreds more fair attendees! Despite a couple of minor issues, the fair outreach booth went swimmingly! A couple of people used the original Keene bitcoin vending machine at the fair, and many others were directed to the BVM at 101 Deals Thrift Store for future purchases. Fair attendees had plenty of good questions and our professional staff of bitcoin-enthusiasts had answers, including Derrick J Freeman and Chris Cantwell. Thanks to all the folks who helped with the booth and everyone who stopped by. If you want to meet with other area bitcoiners, drop into the Keene Bitcoin Network group on Facebook.